"That stuff you are drinking,' responded the scout, 'robbed me of a good father, made him forget his own flesh and blood, and changed him from a man to a brute. That is not my only reason. Years ago, when my poor mother was on her death-bed, she called me to her side, and holding out her thin white hand, asked me to prom­ise in the presence of my brothers and sisters, and in the invisible presence of God, that my lips should never touch the destroyer. Gentlemen, I consider that that vow is registered in heaven, and I have kept it. I do not even know the taste of liquor. Is my reason satisfactory. The misfortune which an ungovernable desire for strong drink invariably precipitates, so wrecked the Crawford family that at a very early age little Jack was compelled to contribute to the support of his mother with all the earnings his youthful and constant labors could create. His education was, in consequence, entirely neglected, and so little care was given to his instruction that not only was he never in a school-house, but at the age of fifteen, when he left home to enter the Union army, there was not a single letter in the alphabet that he knew the name of. In 1863 he enlisted as a private in the 48th Regiment of Pennsylvania Volunteers, serving under Gen. John F. Hartranft, who afterward became Governor of that State. At the battle of Spotsylvania Court House, May 12, 1864, Jack was in the front ranks that led a desperate charge on the enemy's works, in which he fell desper­ately wounded and was carried back to the field hospital. Some days after the battle he was sent to Washington, and transferred from there to the Saterlee Hospital in West Philadelphia. For many weeks he lay upon a bed of terrible suffering, but it chanced that he fell under the tender care of a Sister of Charity who nursed him into convalescence, and then began to give him lessons, first in the A B C's, and then led him along gradually until, under her tutelage, he learned to read and write. Hav­ing thus become possessed of the primary elements of as education, he continued in the acquisition of knowledge, unaided, and became at last fairly informed. After recovering from his wound, Jack returned to his regiment, and remained in active service until the 2d of April, 1865, when he was again wounded, at Petersburg, Virginia, and had not recovered when the army disbanded at the close of the war. 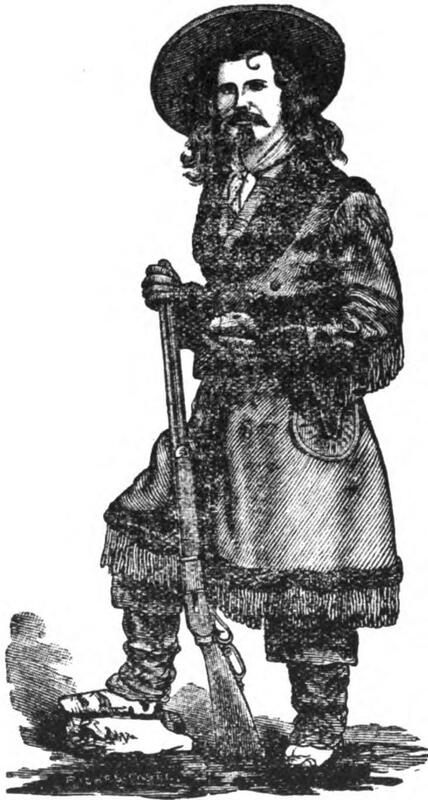 In the latter part of 1865 Captain Jack's mother died, and being now alone in the world, and moved by a nat­ural craving for adventure, he started west, bearing with him letters of warm recommendation from Gens. Hart­ranft and Sherman which introduced him favorably to frontier army officers and he soon after found congenial service in the Western camps. He was one of the first white men to enter the Black Hills, and became the founder of Custer City, Gayville, and Spearfish, in Dakotah, and was one of the original organizers that laid off the towns of Deadwood and Crook City. In the Indian campaign of 1876 Capt. Jack was second in command of Gen. Crook's scouts, and superseded Buffalo Bill as chief on the 24th of August of the same year, Bill having resigned to reorganize his theatrical company for the season of 1876-77. As a horseman and rider Capt. Jack is extraordina­rily skillful, while as a scout and Indian fighter he has honestly earned great renown. Among his more celebra­ted rides may be mentioned one he accomplished in July, 1876, when in response to a telegram he rode from Med­icine Bow, on the Union Pacific railroad, to the Rosebud and Little Big Horn, a distance of nearly four hundred miles in five days. This feat of wonderful speed and endurance was performed, too, through a country literally swarming with hostile Indians, several of whose camps and villages he was compelled to pass within pistol shot of. On another occasion, being engaged as a special mes­senger for the New York Herald, whose special corres­pondent was with Gen. Crook's army, Capt. Jack car­ried an account of the battle of Slim Buttes to Ft. Lara­mie, a distance of three hundred and fifty miles, in less than four days. In accomplishing this unprecedented ride he passed five couriers and arrived more than five hours in advance of the fastest, but he killed two horses in making the journey, for which the Herald allowed him $222.75, besides giving him $500 for the service. Capt. Jack's adventures have been numerous and thrilling, many of which he has related in verse, which he writes with terse fluency and rhythm. In 1873 he join­ed Buffalo Bill's troupe and played a leading part for two seasons very satisfactorily, but he preferred the wild life of the far West and returned to his old home in Da­kota. During the late war, in 1879, Capt. Jack was employed as scout and trailer and was engaged in several of the hot­test fights of that campaign. 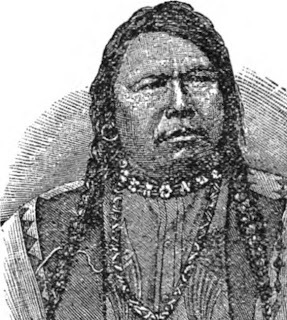 He was well acquainted with Chief Oura, whose friendly services he did much to secure and through whose influence with his people hostilities were brought to an early close, and the captive Meeker family restored to the whites. 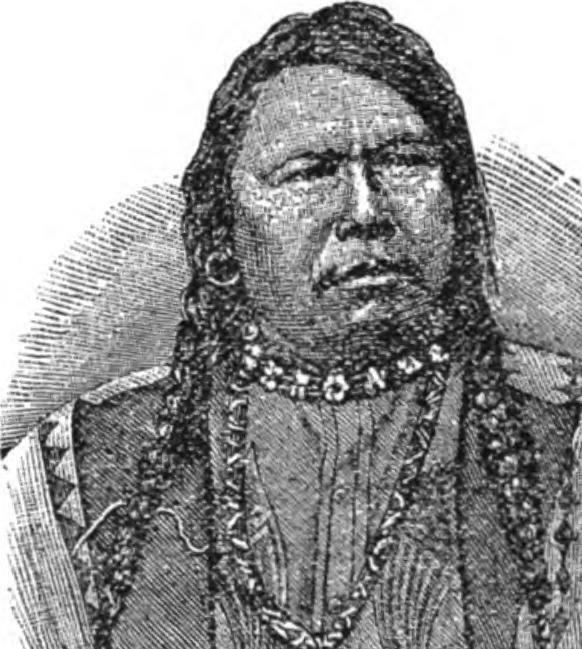 Oura's death occurred in 1880 on the Ute reservation. He was an able chief, pro­gressive, intellectual, and ambitious to bring his tribe under the civilizing and elevating influence of the white people, for whom he ever cherished a warm and friendly feeling. As a man Capt. Jack has always enjoyed the greatest popularity; be is a thorough gentleman, an excellent scout, good Indian fighter, and his morals have ever been regarded as phenomenal by the hardy and generally reck­less characters of the frontier. His affection for Buffalo Bill approaches veneration, and more than half of his poetic effusions are dedicated to or founded upon some incident in Bill's life. As a poet, Capt. Jack deserves the admiration of every one capable of appreciating poetic genius. Deprived of all the cultivating influences calculated to suggest the sentiment of verse, his own innate, self-created endow­ments made nature assert itself, and he has written poetry because this manner of expressing his thoughts and ideas was more natural to him than prose. There is no profound or aesthetic phraseology in his verses, but they abound in what is vastly superior: ennobling and sublime rhapsodies which reveal the God-given poetic gift beneath the uncultured exterior. His style most resembles that which distinguishes Bret Harte, which, though it is less elegantly rounded with rhetorical finish, nevertheless breathes a purer and loftier sentiment, and a more divine creation than Sierra's poet can boast of. He is still living, in the hey-day of life, and at this date (October, 1883,) is mining in New Mexico. Whether as chief of scouts, town trustee of Custer City, chief of the Red Rangers, poet at the banquet table, author, actor, or "poorest man on the range," Capt. Jack is always the same good-natured, accommodating, generous and genial gentleman, with a true heart, and the spirit of devotion for his friends.